“You can see Lewes lying like a box of toys under a great amphitheatre of chalk hills … on the whole it is set down better than any town I have seen in England”. “What a lovely place to live”, visitors say about this vibrant medieval town which is situated in the South Downs National Park. Lewes is full of history, fascinating architecture, ancient buildings, little passage-ways, (known as “twittens”), steep cobbled streets and specialist individual shops and cafes. HISTORY – Lewes Castle – A Norman castle that is 1000 years old is well worth a visit. If you climb to the top when the weather is clear the views are wonderful and far-reaching. There is the Museum of Sussex Archaeology which houses the Lewes Town Model, which is a very well thought out short film of the history of the town. Lewes Castle is also a wedding venue. Anne of Cleves House – bought for her by Henry V111 – now a museum and a wedding venue. Priory Ruins and herb garden. Bull House – Home of Tom Paine, the English/American political activist. Southover Grange Gardens – well kept and stocked with seasonal plants and flowers. A peaceful place to sit on a sunny day. The Sussex Guild Shop is in the corner near the house and in the summer months there is a kiosk selling sandwiches, teas and ice creams. NATURE – Lewes Railway Land – An oasis of calm on the edge of town. A lovely place to walk filled with wildlife and wild flowers. Please follow this link to Wikipedia, which has a comprehensive and interesting guide to Lewes – http://en.wikipedia.org/wiki/Lewes. SHOPPING – Lewes is full of interesting and unique shops to include jewellers, silversmiths, bookshops, both old and new – (including a 15th century bookshop) – shoe shops, fashion boutiques, gift shops, art galleries, specialist food shops, florists, china shops and last but not least, so many antique shops that they have their own booklet and map! There is a thriving food market held every Friday morning and a Farmers Market held twice a month. On occasions visitors from France come over to the market to sell their produce. EATING AND DRINKING – You will find a wide choice of places to eat ranging from small cafes and patisseries to pubs and restaurants offering anything from a light lunch to a gourmet dinner. 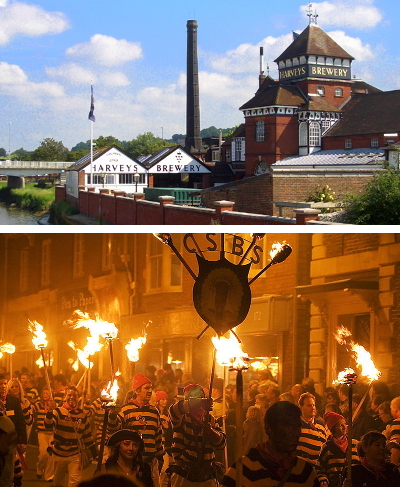 Lewes has its own well-known brewery – Harveys – whose beer is on offer in many of the local pubs. Harveys Brewery also has an excellent shop. EVENTS – The following events take place every year. November 5th is a huge event for the town of Lewes. Thousands pour in to see the Grand Procession with members of the town’s bonfire societies and surrounding villages marching in magnificent costumes. They carry flaming torches through the ancient streets to commemorate the memory of 17 Protestant martyrs who were burnt at the stake in Lewes between 1555 and 1557. It is an amazing spectacle on a massive scale. The evening then continues with each bonfire society hosting its own firework display. This is not a suitable event for very young children or pets! Lewes Folk Festival, Lewes Beer Festival, Lewes Chamber Music, Octoberfest (a series of local food events in the town) Proms in the Paddock (an open air music evening with a brass band and fireworks – bring your own picnic), Lewes Monday Literary Club. All these events can be found on the local website, Viva Lewes, as below. There is also a thriving theatre, Lewes Little Theatre, and soon to be a new cinema. Artwave – local artists invite you into their homes to see their works – usually at the end of August. For all up and coming events please refer to Viva Lewes which is kept up to date with all that is going on in Lewes and around. http://www.vivalewes.com.